Large enterprises and small businesses have all embraced the benefits of moving their applications to the cloud, such as increased flexibility, scalability, and redundancy. Though some organizations are still warming up to the use of cloud based infrastructure to do away with complex IT infrastructure, they still need to evaluate the changes to their cloud estate that can help streamline their business operations and accommodate the ever growing number of business users. 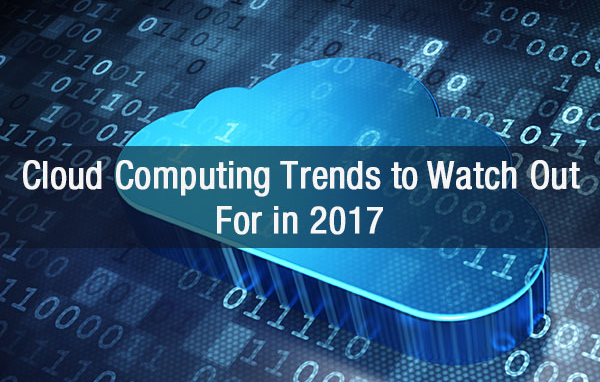 To lend a helping hand, the blog post discusses 5 cloud computing trends from 2016 set to dominate the market in 2017. Many organizations spent a large chunk of their IT budgets for 2016 on cloud based applications, and the trend is expected to continue in 2017. More businesses are likely to replace bulky IT infrastructure with redundant and dependable cloud based applications. The cloud market is expected to register $146 billion by the end of 2017, going strong at an annual compound rate of 22 percent. Major players such as Amazon Web Services could reach $14 billion dollars in revenues alone, followed by Microsoft Azure and Google who will also claim their share of the cloud market. Related read – How to Build a Cloud Computing Infrastructure? The idea of serverless computing started gaining traction in 2015, and is all set to rule the cloud market in 2017. Though the term “serverless” is a misnomer, the technology allows IT admins to build applications without provisioning and infrastructure sources. Utilising serverless computing, developers can focus more on improving the code without operational concerns such as pre or over provisioning users. Many organizations leveraged serverless computing to save operational costs and do away with unnecessary wastage of machine resources that are not being utilised. To aid in such efforts, Amazon web services introduced the Lambda platform in 2015, followed by other key players such as Microsoft and IBM. While machine learning and serverless computing dominated 2016, cloud containers will take centrestage in 2017. Container technology or containerisation is a shift from the traditional server building model and allows IT administrators to deploy and run distributed applications without launching the whole VM for each application. Moreover, they share the same OS kernel, unlike traditional VMs that require separate OS instances. As containers don’t require overhead resources, as in the case of VMs, they enhance the speed and overall performance of operations. That’s why more business operations will be shifting to container technology in 2017 and requiring support in securing and maintaining IT infrastructure. Though organizations continue building next generation IT infrastructure through the public cloud, they are particular about disaster recovery solutions. For that, a large number of organizations will rely more on a hybrid cloud approach to prevent latencies in application usage during peak periods. Through the mixed approach, organizations can always switch critical applications to a public cloud during outages, such as inclement weather, scheduled maintenance windows, and application roll-outs, and operate on the private cloud model for the most part. The hybrid approach allows any organization to run complex processes on the public cloud and the simpler ones on private cloud to save on operational expenses. Many organizations are currently distributing application workloads among different cloud service providers, and the trend is set to grow in 2017. As businesses realise the benefits of cloud, including the scalability and flexibility, alternating between two or more providers will become a more common and widely accepted practice in 2017 and beyond. Developing IT infrastructure that is able to utilize such a set up and deliver the desired applications to business users still remains a challenge and needs to be sorted first. Vendors such as Amazon Web Services, Microsoft Azure, and Google will continue to dominate the cloud segment as the preferred choices for businesses seeking to use multiple cloud service providers. Leading cloud service providers, including Amazon Web Services and Microsoft Azure will continue to dominate the market as more businesses look migrate to the cloud. To maximise the benefits you reap from your investment in cloud, you need a trusted cloud service partner who is well placed to deliver. i2k2 Networks has got you covered, with a range cloud computing solutions that appeal to your needs. Leveraging over a decade of IT expertise, our consultants are ideally positioned to help you select the best cloud solution for your business and assist in a cost-effective and hassle free migration. To learn more, fill out our contact form or call us at +91-120-466 3031.